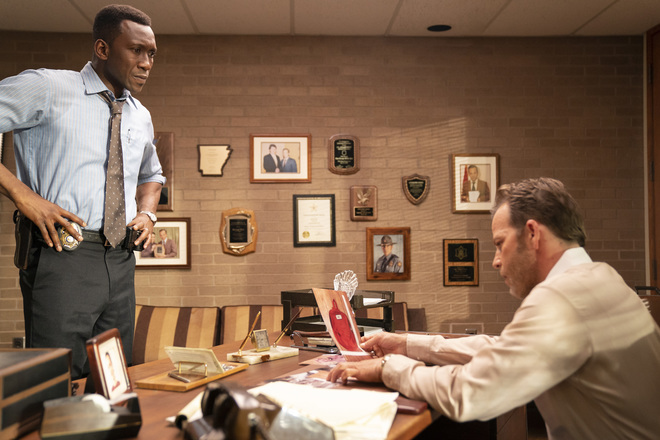 True Detective Season 3 Episode 5 Review: 'If You Have Ghosts' – AiPT! Season three of True Detective has been a hard show to define. The plot revolves around the disappearance of two children in 1980. The story is not just a simple missing children’s case. This is a complex mystery with many twists and turns that spans decades. It is also about how one case can affect many lives. The HBO drama has more character development than is usually seen in police dramas. The third season of True Detective has covered three different eras. The one constant during the entire time has been the case. The show has done a great job of showing how dramatically lives have changed over time. Episode five focuses on how the case has impacted the life of Woody Hays. When the Purcell children first went missing, Hays was on call and reported to the scene. He spoke with the parents, neighbors, and searched for clues. He was even the person that discovered one of the case’s first major breakthroughs. Even after its seemed like the culprit had been captured, the case kept coming back into the life of Hays. Unsurprisingly, it has had a negative impact. True Detective has shown the relationship of Hays and Amelia many times. As expected, things have not always been smooth, but it has always been made clear that the two love each other deeply. The fifth episode shows the problems were more than just typical marital strife. It is clear that the return of the case has put severe mental stress on Hays. He is short, disrespectful, and seemingly spiteful of his wife. The issues between the two that seemed normal are obviously much deeper rooted. The other person who has been a big part of Hays’s life is Detective Roland West. While Hays has been relegated to desk work, West has managed to increase his stature in the state police. He has risen through the ranks and by 1990 is leading the reopened investigation. He immediately looks for his old partner to bring him on to the case. The two have not talked in years, but West easily talks his hold partner into coming on board. Things have changed, however. The two do not have the same easy going relationship. Hays seems more bitter and jaded. Meanwhile, West is more of the company man who wants to do his job, but also wants to make sure not to anger anyone who is above him. There was always a tension between the two, but it worked in their favor. When they reunite, it is quickly obvious the differences they have may be more than they can work through. This is verified when the two meet as older men and talk for the first time in literally decades. Time has been an important part of True Detective. The season has jumped from 1980 to 1990 to 2016. Where it has excelled is how it has still shown progression. This is not just shown in how more clues and revelations are added each week. The amount of time spent in each era also seems to be increasing. The fifth episode of the show spends more time in 1990 than previous episodes. It gives a sense that the show is moving forward. It is subtle, but still very noticeable. There are many layers to the series, but it is a mystery first and foremost. Episode five not only packs in emotion, but has an action packed scene. It is a nice change of pace that keeps with the tone of the overall plot. There are also more clues being discovered and the reveal of who was initially convicted of the crime in 1980. This has the dual effect of closing off the 1980 portion, but still leaves questions. ‘If You Have Ghosts’ is not perfect. There are still occasional odd musical cues. The closing moments of the show are also very touching, but also give off a wacky buddy cop vibe. There is nothing funny about the scene, but it is hard not laugh. Overall, this is a very good episode that progresses the mystery and will keep viewers interested. Arguably, the strongest episode of the season. There is a great mix of action, emotion, and intrigue that will keep audiences riveted. More mysteries. What and who has Hays ruined in his life and why?